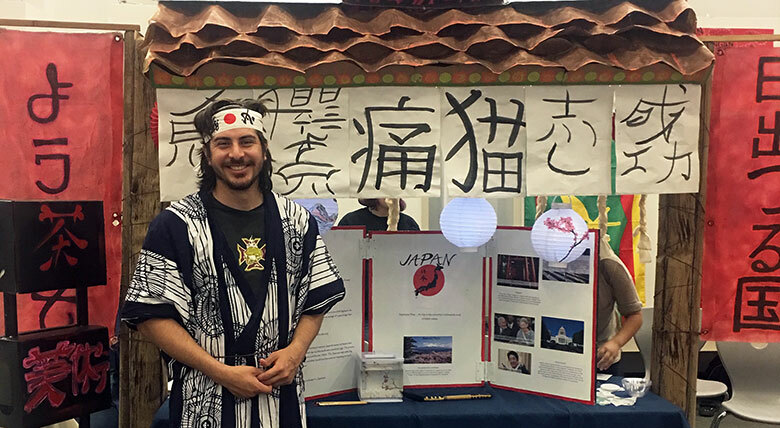 In the interest of cultural enlightenment, this year’s World Expo at Arizona Western College touched on the games, food and history of countries from all over the world. 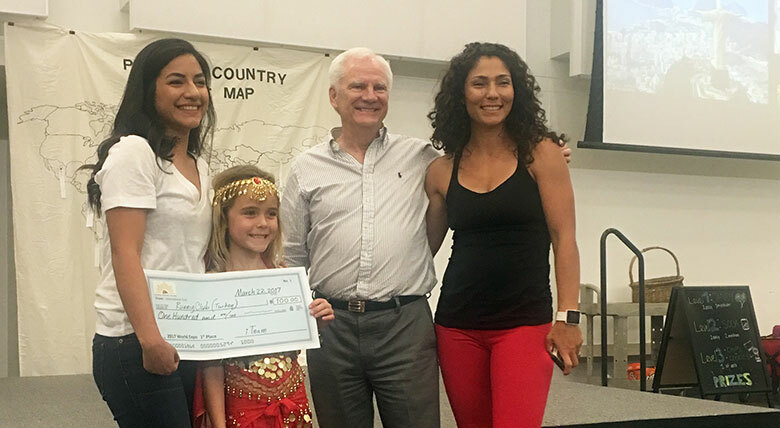 “I was inspired when I was in elementary school because we did it there,” said Rebecca Bailey, supervisor of the expo and originator of the idea. In order to participate in the March 22 event, participants needed to have at least a trifold. Students brought in elaborate attire, games involving the culture and even food for observers coming in. Countries like Polynesia made eyes pop with their shirtless men wearing lei’s. They explained that their country was very close to the equator, and they wanted to represent how it’s always so warm there. “Its why we’re so dark,” said Michael Agiga. Japan made an appearance, very detailed and gracious with their displays. President of the League of Artists, Issac Tafoya came up with the creation of the booth. Lolo Walker wrote the phrases on display, including “fish,” “school,” “cat,” “determination” and “duck” – all in Japanese writing – and Rodolfo Alvarado provided visuals by wearing a kimono and helping with the Kon fish game. “Anime and Manga wasn’t the only reason why we picked Japan,” Tafoya said, mentioning his own connections to Japan, such as life experiences and relatives living there. The displays for Brazil, France, Egypt, Cuba and Turkey all demonstrated a lot of creativity and knowledge. The Turkey display included a lot of history and some artifacts, such as their flag. Brazil served typical food, France had a live violin and women from Greece wore traditional clothing. At one point, the organizers had students and staff all come around the middle to participate in a Zumba dance party. Smiling faces, laughter and music filled the room of the allowing everyone to come together as a global gathering. An award ceremony took place at the end, with prizes to booths based on creativity and effort as well as a raffle for a $25 gift card to Chili Pepper. The $100 prize for the first-place booth went to Turkey. 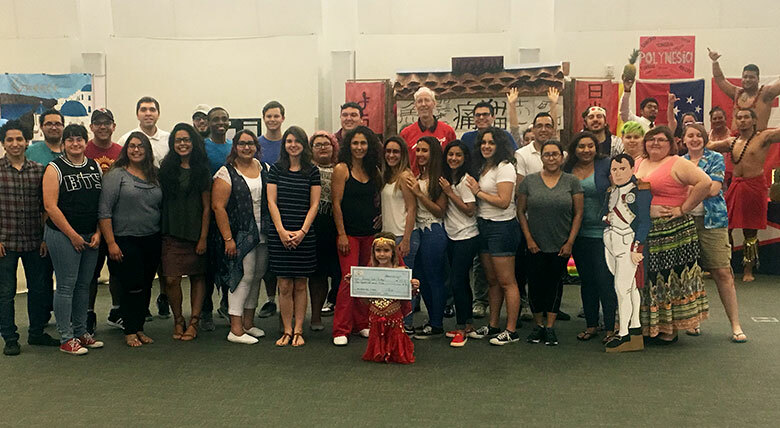 Second place and $75 went to Japan, and the Polynesian Club took the third-place award of $50. Finally, everyone gathered around and took a group photo to end the journey of different cultures.